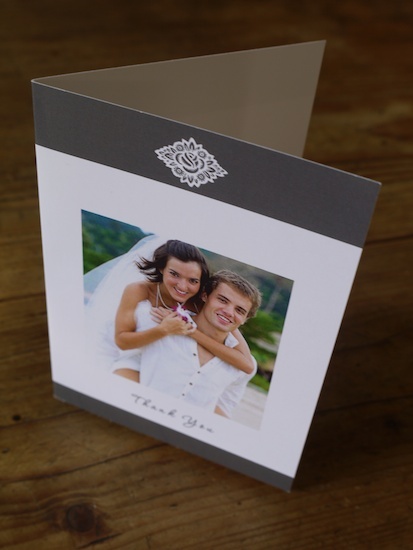 There are a bunch of different ways that you can cards done for your wedding, party, baby, thank yous and...well what else is there? Maybe you're letting everyone know you're off to break a free-fall skydiving record. Whatever it is there are companies that cater for it. One such company is Photo Card Creations and they've kindly send me some samples so I can have a look and let everyone at Cool Photo know what I think. The website is pretty straight forward to use. 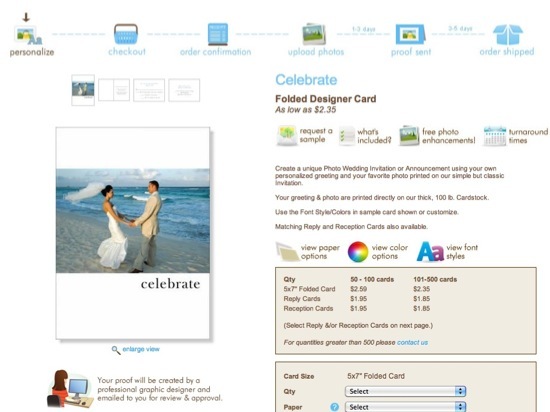 There are between 20 to 50 templates you can use for each category (wedding, thank yous, birth announcements etc.) and once you've narrowed your selection to that category you can customise your card if you order a minimum quantity - it was 50 for me with the template shown above. 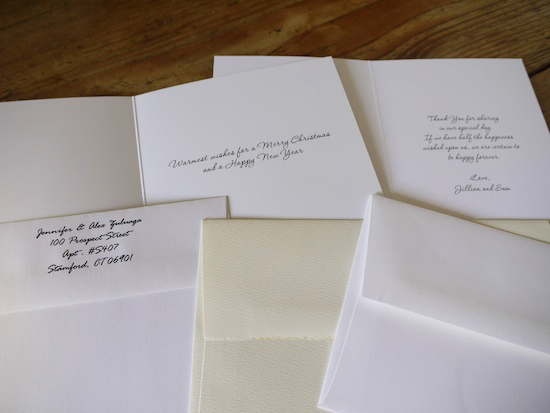 Some of the available options are: font styles and colours, text inside / outside the card, return address printed on the back, reply cards, reception cards, paper and envelope types, postage pre-paid, addresses pre-printed and of course you can upload your own photo. The list goes on and chances depending on the template you choose but they seem to have all the options covered. There is no live preview as you change the options but really this would be very difficult to do with the dozens of options available and if you're spending between $250 and $700 on invitations you're going to want an emailed proof at least but probably I would go with the physical proof for that kind of money. Generally Photo Card Creations seem competitive with other supplies on price, but what about the quality? The print quality of the cards is pretty good, images look sharp and colours well saturated. 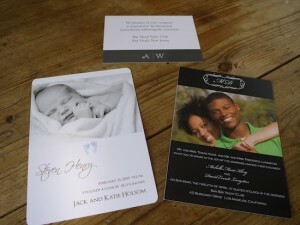 I liked their semi-glossy card stock the most (wasn't keen on the glossy but that's just my preference) and the rounded corners - see card with baby announcement - is a nice touch. Again there are different types of paper stocks available such as matt, textured with frayed edges and full gloss. 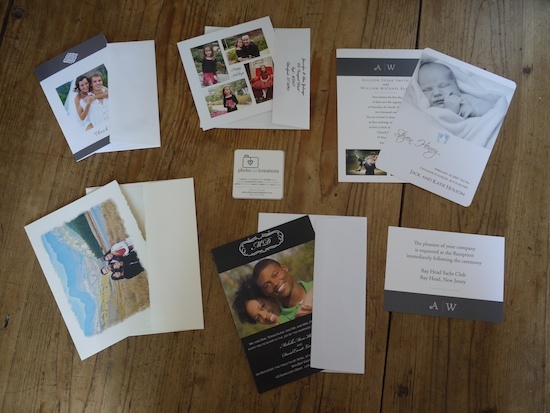 All the sample cards I received were designed in a simple and elegant way, which I think is a good thing when a company offers pre-designed templates for you to choose from. Many other supplies have more templates but they are almost unusable - these guys have kept it straight forward and I like that. They are all generally well designed and I love some of the graduation ones. 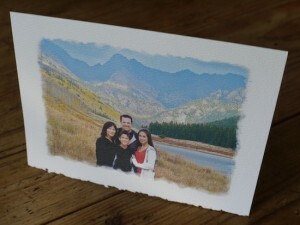 Certainly the service they offer is more personal than others and offers good value at $2.35 per card for a 5 x 7" (150 quantity) including envelopes and a physical posted proof and I would certainly recommend using Photo Card Creations if you don't want the hassle of doing it all yourself or you're in a bit of a rush. If you'd like to give them a try you can visit their website here and they've very kindly offered one of our lucky readers a $50 coupon - all you've got to do is email us with and tell us how many design templates they have in their graduation category. The winner will be picked randomly and announced next week.